Why anyone would want to spend thousands of dollars for a domain name you can register at GoDaddy for $8.99? Simply put, a premium domain can greatly impact whether or not your startup or product succeeds or fails. When you start off your online business with a premium domain name, you are investing in an intuitive, unforgettable name which will help differentiate your business in the crowded online marketplace. Domains are deemed “premium” and expensive if they are memorable, and easy to spell; two branding elements that are normally very expensive to acquire. Also with premium domain names like cheapwines.com, cars.com, meat.com, etc., you don’t have to guess what you will find; the domain makes the value proposition clear. This saves brands from having to invest significant amounts of money and time branding in order to shape the users perception around your offering. Premium domains also give customers a sense of trust and authority. Users will, for instance, have more trust in doing business with www.Cars.com versus www.Find-Cars-Online.us. This gained trust is mostly due to the fact that today’s online shoppers generally understand domains like Cars.com are rare and expensive; fly by night operations are not run on such an expensive property. This trust and authority directly influence users purchase decisions leading to a higher conversion rate. Best of all trust flows into other marketing aspects like email and display as the domain is at the base of those efforts. Premium domain names can effect search engine rankings as well but not in the way you would expect. It’s true that the Google Exact Match Domain (EMD) algorithm update minimized any sole benefits to rankings exact match domains or keyword rich domains have. That is to say, you can’t slap a valueless website on a high power EMD and expect to rank like crazy anymore. However premium great domains help with link acquisition. 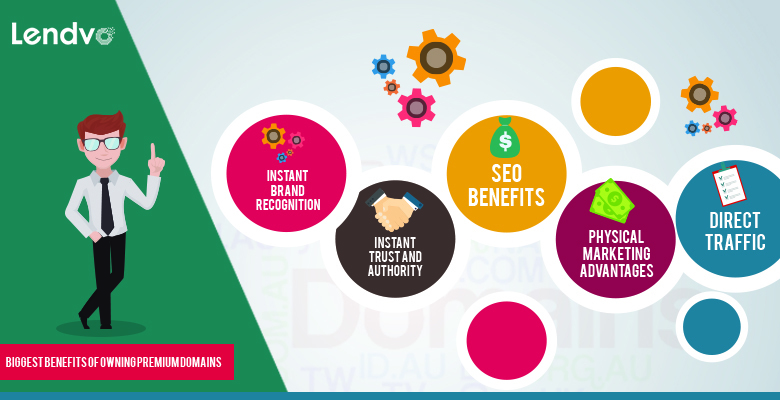 Great domains provide a sense of trust and authoritativeness with webmasters which helps with outreach (higher email outreach open rates) and link placement. Also EMD’s allow you to naturally use “money” keywords as anchor text as those money keywords make up your brand name. Both avenues can help you get more and better links. Depending on the name and its vertical, certain premium domains carry large volumes of direct type-in traffic. That is people who just type in the full domain name in the browser bar to search for something (as opposed to going through search engines). The result is an instant flow of high quality traffic; in fact direct type-in traffic usually carries extremely high conversion rates. A premium domain name is the perfect base for all non-internet based advertising like billboards, print ads, TV, radio, etc. Because premium domains are short and memorable, physical strategies that utilize great domains have a high success rate of users retaining the URL and visiting when they are ready.